Analysts have warned that President Robert Mugabe and Zanu PF cannot afford to have wholesale purges to former vice president Emmerson Mnangagwa’s allies saying doing so would be akin to scoring an own goal, especially when elections are looming large on the horizon. This comes as the Zanu PF National Disciplinary Committee (NDC) is set to hear and determine cases of more than 100 senior officials said to have been backing Mnangagwa’s bid to succeed Mugabe. Among those facing the chop are ministers — Patrick Chinamasa, Kembo Mohadi, Oppah Muchinguri-Kashiri, Josaya Hungwe, Christopher Mushohwe, Christopher Chingosho and Win Mlambo — whose hearing dates are yet to be announced. At the same time, some of these ministers may not be eligible to participate in the central committee elections which get underway this week as Zanu PF has given a directive that those appearing before the NDC can only contest after they have been cleared. University of Zimbabwe politics lecturer Eldred Masunungure said Mugabe was unlikely to sanction wholesale purges of Mnangagwa’s allies. “It would be very unwise for Mugabe to undertake such comprehensive expulsions. He is likely to be more cautious. He knows he cannot be alienating himself from too many provinces. “He may select a few of the most troublesome for expulsion but over 90 of them may survive. “The day is not far when the party would turn into a one-man army, and the president would go to a mirror and say to himself: Comrade, I expel you,” Masunungure told the Daily News. Another political analyst, Rashweat Mukundu, concurred with Masunungure saying Mugabe was likely to take a different approach as elections were nearing. “Mugabe may employ the divide and rule tactic whereby he targets the most influential of Mnangagwa’s allies and uses them as an example. The intention is to avoid the regrouping of Team Lacoste. We may not witness the expulsion of so many,” Mukundu said. A Zanu PF insider told the Daily News that he had already showed such signs during last week’s politburo meeting. “The clearest manifestation of that was at the politburo meeting on Wednesday when he stopped (Zanu PF national political commissar, Saviour) Kasukuwere from reading a list of names of persons which had been submitted to his office by respective provinces for expulsion. This was soon after ED had been expelled. “The president interjected Kasukuwere as he read the third name, saying the meeting was not meant for purging party members and he suggested that the issues raised should go through disciplinary procedures laid down by the party’s constitution,” a politburo member told the Daily News. However, political commentator Maxwell Saungweme said Mugabe was likely to sanction wholesale purges as he was determined to rid the party structures of Mnangagwa’s trace. “It seems such a decision won’t make political sense. But the Mugabes are not worried about the future of Zanu PF but security of the first family once Mugabe is gone. “All decisions the old man is making are from his wife who is getting influenced by political opportunists who want to secure personal wealth and political interests post Mugabe. “So nothing makes much sense in Zanu PF but everything is calculated in such a way that once Mugabe dies Lacoste will have no control whatever of any Zanu PF organs or government functionaries,” said Saungweme. Another political analyst, Shakespeare Hamauswa, said basing on history, Mugabe was capable of dismissing all of them from the party. “But in light of his political strategies, he might spare a few. This will be done to retain some semblance of stability in some other provinces. “But this will not mean Zanu PF factionalism will be coming to an end. The problems will end when Mugabe passes on the button,” he said. Mnangagwa was fired by Mugabe on Monday, in a decision which surprised many Zimbabweans who had erroneously believed that the former VP would be dumped after Zanu PF’s December extra-ordinary congress. 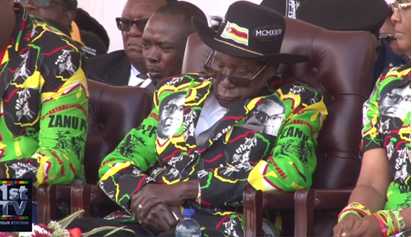 The longtime Mugabe aide was also booted out of Zanu PF on Wednesday when the party held its politburo meeting where it recommended tens of officials accused of supporting Mnangagwa’s bid to succeed the 93-year-old, to go for disciplinary hearings. Until last Monday when Mugabe fired Mnangagwa, the two men had shared a very close relationship dating back to the days of the liberation struggle. Mugabe first met Mnangagwa, 75, when he was working as a teacher in Mapanzure, a remote rural village in Zvishavane from where his deputy hails. It is believed that the two’s relationship blossomed when Mugabe came back from Ghana where he was teaching to join the liberation struggle.